Brown Pundits: Help a Brother out? LOL! It looks like he is in UAE from the phone number. How can you be unemployed and stiill reside in UAE? 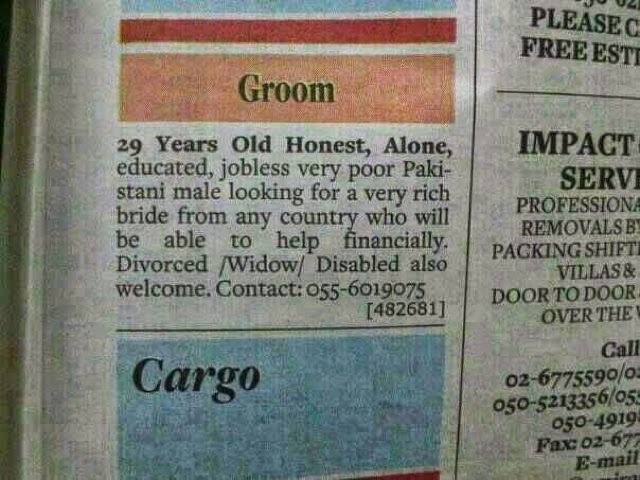 Anyhow if he is a good looking Pak and has got some game, he can hook up with perhaps a rich divorced Emirati female. It happens every now and then. Especially if the Emiratis have Pak/Indian ancestry. Don't the Emiratis have a spinster crisis?